I am surprised that Fidel Castro gave - perhaps - the shortest speech ever. In his career, this week! News-item here. Four-and-a-half hours. That was Fidel Castro's 1960 UN General Assembly speeech record. 4 1/2 hours! So, 11 mins is a surprise. Age is taking its toll. And the length of the duration of your speech is, probably, inversely proportional to your age (Joel's theorem). Did you know that he was already the President of Cuba by the time I was born? 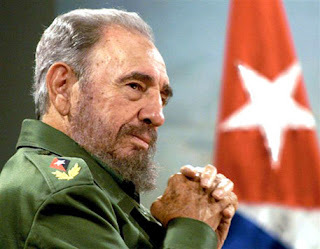 Infact, he continued to be the President of Cuba, until just four years ago. Until, he handed over the reigns of the country to his brother, Raul. and the world thought that that was the end of it. But he is back again. 'Alive and Kicking', is definitely the right phrase. He lambasted the world powers, for tottering on the brink of war. He chided the great governments, Especially, Obama's. Many years ago, he also caused great fear to the government of Kennedy's. Poor JFK had the toughest time, with entire world on the brink of a Nuclear War at that time, with the Cuban Crisis. Wonder what crisis is brewing now. But it's small wonder that Our Man in Havana is giving a lot of impetus to the likes of Iran and Venezeula, and their overt display of anti-american sentiment.